Its Spain - and of course it's 6 battle reports which are as tasty as a Korean barbecue with added Chorizo and Manchego ! The occasion is a competition in Pamplona, the home of the running of the bulls which was of course an ideal place to try out an army which may in itself be a load of old bull. But even more pertinently they are the Koryo Koreans and their War Wagon Wagon Train, a novelty item often overlooked in ADLG. Will the cunning Koreans make the wagons work in these six trucking good battle reports? The wheels are certainly rolling - will they come off, or will they ride to victory in Spain? 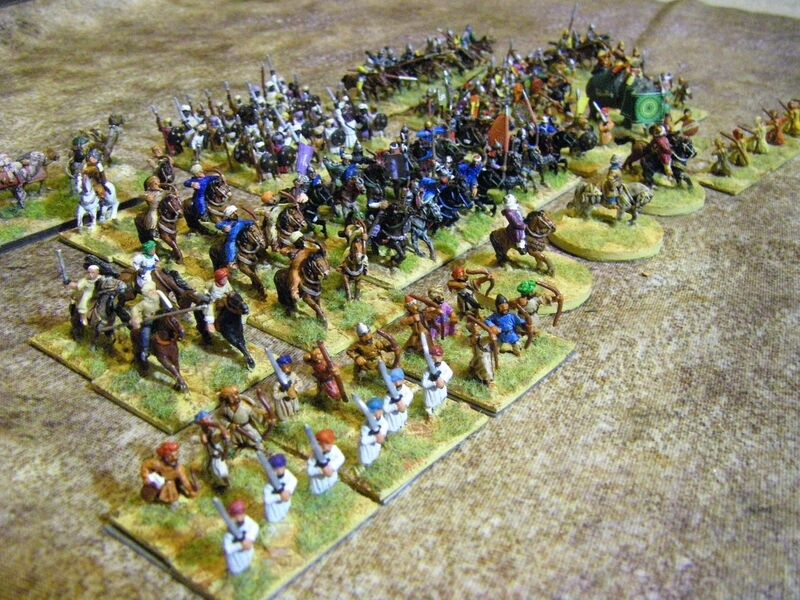 After being somewhat impressed with a Sea People army last year at a competition in Ireland I've added a few more of the excellent ex-Gladiator Black Hat figures now sold by Fighting 15's to my New Kingdom Egyptian army such that I can now also field a full Sea People force. For the Medium Foot I've kept all of the similarly-hatted guys together to give some vague impression of different tribal sub-groupings fighting as pseudo "units"
I didn't really buy enough figures though to make that work for the close formation units, especially as I added in a load of random spare Egyptians and other biblical and loincloth-clad waifs and strays from the parts box to make up the numbers, so the Heavy Foot are a bit more of a mysterious rabble. Having originally bought the first half of this lot many years ago I'm actually quite pleased that I still had the same flesh wash (GW) to make the new figures look consistent with the old ones as well. I even picked up some tribes that I didn't have any of first time around. 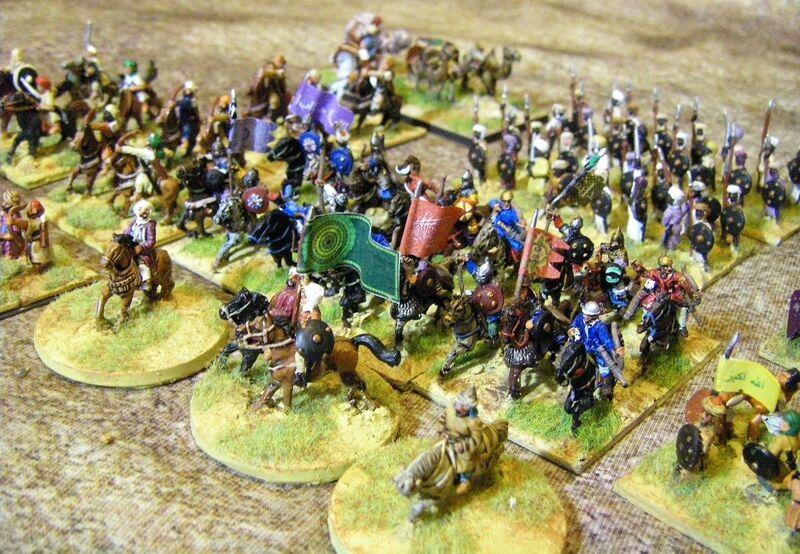 The colours are entirely speculative - but these are really well animated and easy to paint figures so they may well be sweeping across a table at you sooner than you think! With a shwoosh of clackers, and a dusting-ioff of the family jewels the Galatians take to the table in five separate match reports against the Romans, Germans, Seleukids, Bactrians and the (who the f--- are the?) Blemmye, in the post-tournament report from Bournemouth earlier this spring. There is of course the usual mix of captions, videos, both handy and unhelpful rules-related hints and poor quality humour throughout. This time however you also get a specially themed report of one of the battles which features extensive references to the 1970's Bay City Rollers knock-offs from Bradford, "Smokie" - not for the faint-hearted, so if you are easily offended please feel free to skip report number four! Go on - get your undercarriage out into the fresh air this lovely spring morning, lie back and enjoy these five fine reports ! 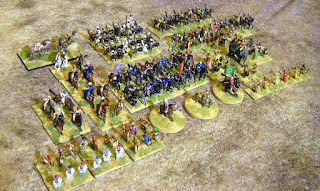 The last (for now) iteration of the Great Biblical Army Painting Frenzy is three units of levy. They fit naturally in the Assyrian army, where the high quality (and cost) of many of the line troops means that adding in some levy occasionally may well be a good idea, but there are other armies than can also use some. too. With that in mind I chose to use Museum's Minoan and Mycenean range as the basis for these units, making them up out of naked spearmen and bowmen, together with a couple of slinger figures - as how much more generic can you get if you haven't got a uniform at all? The paint job is kinda simple! I guess if I ever try and run more than he 9 proper Mycenean spear units I own I could even press-gang these to serve as extra (ill-equipped) spearmen! 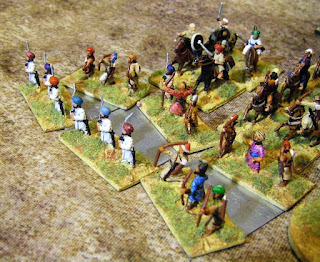 Finalising (I hope...) the Assyrian project, and having actually looked at what might be a viable list before buying the figures this time I've added some Heavy Swordsmen and Javelinmen to my Assyrian army. All of these figures are still from Museum Miniatures - it does mean I only have round shields rather than a mix of tower shields and round ones, but hey, I still like them ! For ADLG I'm basing Javelinmen in 5's to a base. These are listed as "Aramaean Infantry Auxiliary spear" on the Museum site, and have an actual Assyrian soldier in the middle of the base as getting two sets of 5 figures out of a single pack of 8 Arameans was sadly beyond me! These guys count as Swordsmen in the rules, so I've tried to keep the number of upright-held-spear spearmen down somewhat and use a lot of swordsmen in the front rank. The guy in the second rank with a crested helmet is an Urartian Infantryman according to Museum, but his shield is the same size as the Assyrian figures so he can sneak in as a second ranker pretty easily. Painting the crest black also means it doesn't jump out at you as being different. The blue shields will mostly be used as the Elite units, with red as the default colour for normal line infantry. Whats that coming over the hill? Is it a Monster ? Or is it a Museum Miniatures Midianite Bedouin Camel? 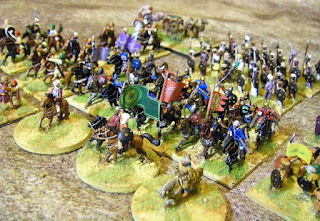 Having bought a dozen of the aforementioned creatures recently to flesh out an allied contingent for my Assyrians my plan was to use some old Essex bow-armed camel riders I had kicking about as the Light Camels and use the double-crewed Midianite ones as the Medium Camelry with bows in the core Early Bedouin ally. But just have a look how these beasts compare size-wise to the Essex camels ! They are great figures, even allowing for the single pose - but boy are they huge! The print quality isn't perhaps as good as it could be as I printed it with a relatively low resolution printer but as a test of concept I am still quite pleased with it. Clogging Hell - We're all going Dutch! 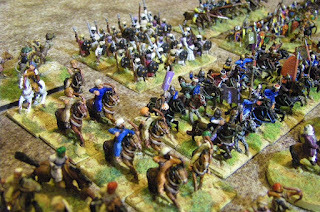 A recent one-day event in Oxford gave me a chance to wheel out some almost forgotten FoG:Renaissance troops in 15mm scale to take part in a tightly themed C16 competition for the armies involved in the Great Rebellions of that era - the French Wars of Religion, the 80 Years War of Dutch Independence and the many Peasant Revolts across Europe. Given the multitude of choices - and because no-one had bitten at my incredibly well crafted attempt at a joke on the FoGR Forum along the lines of..
"How big is your army?" ..I ended up taking the 80YW Dutch, with a vague plan to batter my opponents senseless with artillery whilst reducing my opportunity to make the sorts of mistakes that someone who hasn't played these rules for ages might do by having a plan that didn't really involve moving my troops at all. 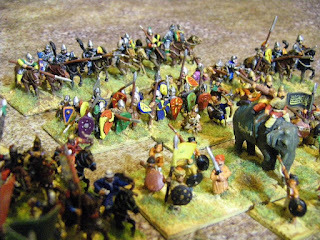 The armies duly swept back and forth across the tabletops in textbook checker board formations and much Dutch courage was taken by all sides. And I used a ship! The USTT L'Art de la Guerre event is one of the bigger North American tournaments which in January 2019 attracted 40 players in teams of 4... including Henry "Tucker" Saglio who was kind enough to agree to be interviewed about his 5 games on the Madaxeman.com Podcast. The interview was conducted over Skype, so there are moments where the audio is a bit patchy, but hey, it's not like you've signed up to this on Patreon or anything now is it? Much to my relief, the ink-washed Xyston figures did come through a spray varnish this morning unscathed. If anything it seems to have helped highlight the definition and texture of their silk-effect uniforms. As you can see from the left shoulder of the chap in the front left corner of this base, there has still been some colour-bleed between the different inked colours, but whether it's something which is worth (or even possible) to touch up without making it look worse is questionable. 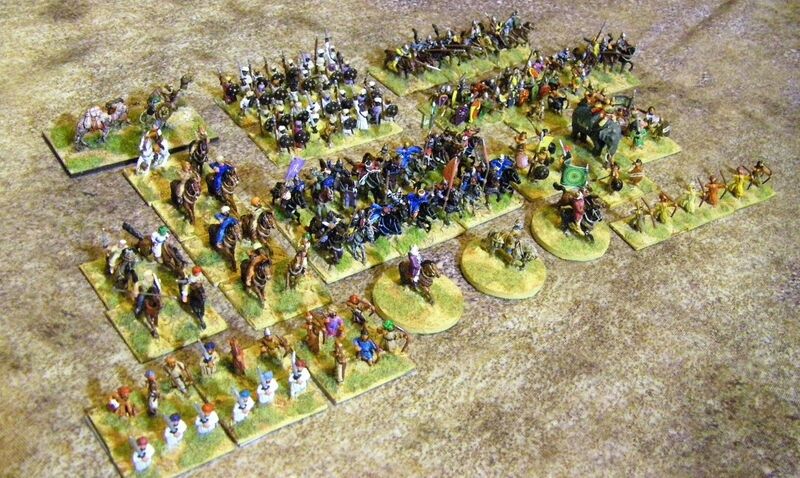 Downsizing my oversized 15mm ancients collection means I have realised that I enough spares to sell on eBay a whole "Arab" army, using figures from various manufacturers to make up armies for many of the "Arab" forces in the L'Art de la Guerre rulebook. 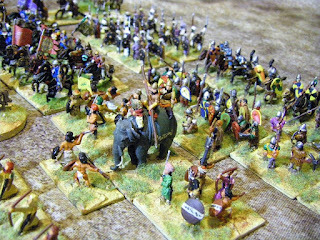 The figures are mostly Essex, but also include Outpost (most of the Arab cavalry) and a few others. They are all based and magnabased. The auction ends around 8pm on Sunday 20th UK time.